Today I am using the Tarot of the Crone by Ellen Lorenzi-Prince. It is centred on the archetype of the Crone and is a deck suitable for deep reflection. What energies are present in my life right now? Two of Cups, Four of Disks, Shadow of Cups. 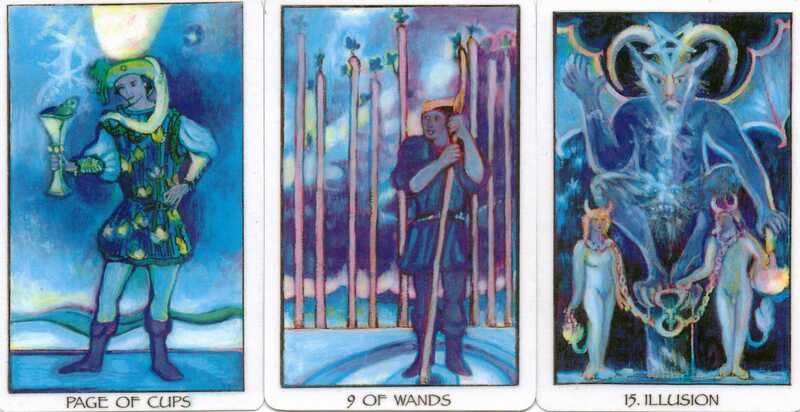 The image on the 2 of Cups is rather arresting. It is one which intentionally plays with a duality and forces us to look twice. I love how there seem to be two cloaked figures bending towards each other in a desire to connect. It reflects a desire to merge and connect deeply with something or someone. So much so, that the 2 cease to be and become one. There is an energy of emotional convergence related to something deeply desired. The 4 of Disks brings us back to earth and more practical matters. It represents a safe place to retreat and relax in – somewhere which is welcoming and peaceful. There is only a simple picture of a standing stone. How does my living space nurture and support me? At the moment, I’m moving towards something I desire but it may be a bit of a roller-coaster. This card reminds me to keep a sanctuary. 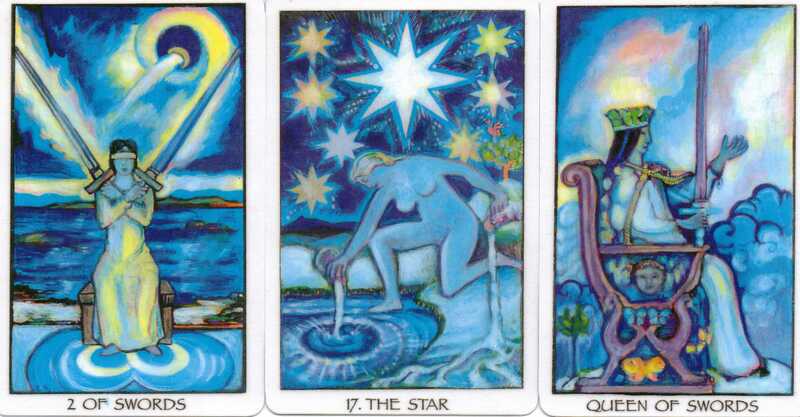 The final card represents an emotional drowning. There is a need here to sink into something, to wallow deeply. A sense of separate identity is lost which may be necessary but care must be taken not to sink indefinitely. It reminds me a little of those flotation tanks. Sometimes, completely switching off is a good thing but it is a state which could lead to apathy and lack of desire to do anything. It can represent a passive acceptance. I need to guard against this. The yellow banner at the top proclaims ‘Aqua’ – water. 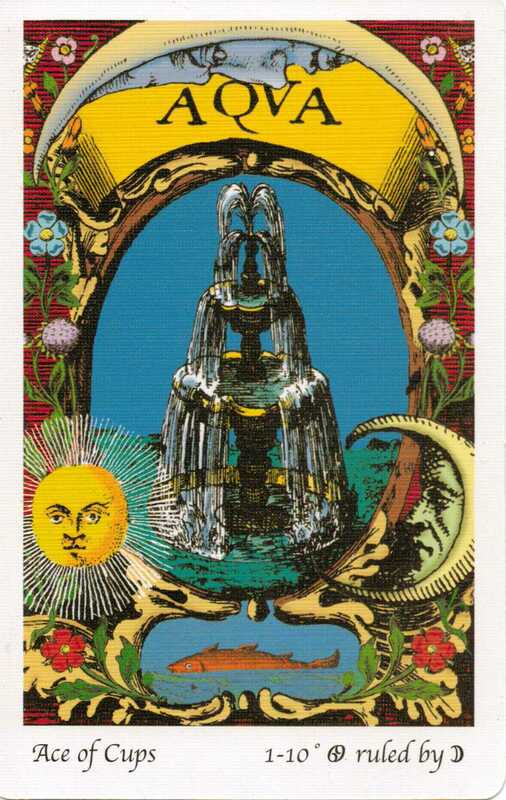 A fountain overflows in the centre in a cycle of endless renewal. It is abundant and a source of compassion and healing. A positive start – although it is something I aspire to rather than manage with any sort of consistency. A fish is at the bottom looking slightly out of place. In fact, it looks like it’s not in the water completely and it has a slightly worried expression! It seems to be thinking ‘How did I get up here?’ The phrase ‘a fish out of water’ immediately comes to mind. So it seems that I may be projecting a feeling of not quite being in the right place. Something about me doesn’t quite fit the environment I find myself in. At least, this is how it appears on the surface. However, the fish is still in water – it’s just experiencing what Air is like too! Perhaps, like the fish, I’m showing that I’m comfortable on the surface but am not showing yet that I am happiest in deeper waters. This card is Cancer ruled by the Moon. A placement where the Moon is quite at home. This reinforces the impression that actually, I’m quite comfortable and at home where I am and with who I am. People perceive that there is a depth of emotion but that I keeps things on a superficial level. A bird is engulfed in flame – is it a phoenix rising from the ashes or is it about to be cooked? The moon looks down dispassionately and the sun lies behind the bird. The idea of 4 is repeated by the birds in the corners and the spheres underneath. The 4 reminds me of the elements – earth, air, fire and water which gives the card a feeling of balance. 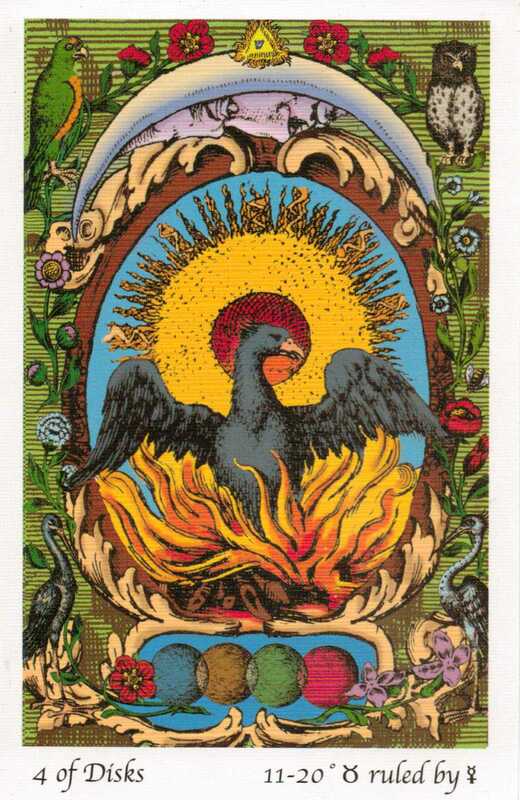 It almost feels like an alchemical process – 4 things have combined to give rise to the bird in the middle who is a blend of them all. This card feels like a rebirth. A process is undertaken to change something and form something new. This indicates that I’m moving towards a time when I will transform. Various elements are being combined and I’m just in the process of blending. I haven’t quite finished cooking yet. 🙂 The fact that this is a card of Disks makes me think that this is a transformation on a physical/practical level. Mercury is being grounded in Taurus. The planet of ideas and communication is held by a stable earth sign. The quicksilver is harnessed and given form. All this indicates that something which begins in thought and ideas will be turned into something of a real practical value. Today I’m going to read just by looking at the card and the ideas it sparks in me. I do have some knowledge of astrology so that will probably creep in too. The first thing which strikes me on this card is the blazing urn which appears to be supported by nothing substantial. The blue robe is wrapped around its base and around the man. He holds a torch in his other hand but seems utterly fixated on the larger fire in the urn. There is a sun above his head and one below at his feet. He stands like a pillar in the middle connecting them both. Behind him, a salamander is surrounded by flames. 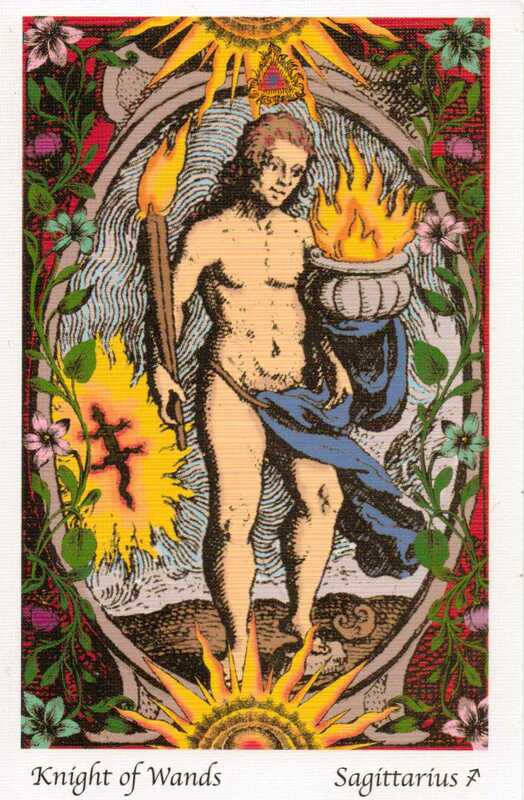 This card is connected with Sagittarius. There is a fascination with fire here. He gazes transfixed at the source of light and warmth in front of him. The light is something which pulls him forward, it encourages him to go exploring with his torchlight at his side. There is a feeling that he might step through the frame and wander off. It seems that today I need to focus on what it is I gain warmth and light from. What is it that transfixes me? What fascinates me enough that I’m ready to venture forth in search of new adventure? What is a burning passion that allows me to lose all track of time and keeps me focussed? Today I will do something that I feel passionate about, that gives me that feeling of light and warmth. I can draw on the Sagittarian spirit of adventure.